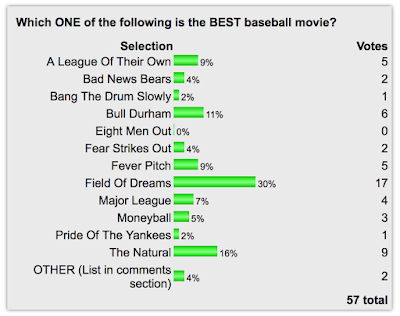 Early voting in our latest FenwayNation Poll shows that most readers (30%) think 'Field Of Dreams' is the best baseball movie. As the chart shows, the next most liked hardball film is 'The Natural' (16%), followed by 'Bull Durham' (11%). Next on the list are 'A League Of Their Own' and 'Fever Ptich' at 9% each, while 'Major League' gets 7% of the vote. 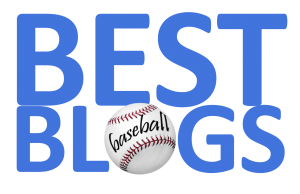 'Moneyball' received 5% of the total, while 'Bad News Bears' and 'Fear Strikes Out' pulled in 4% each. 'Pride of The Yankees' and 'Bang The Drum Slowly' notched 2% each. You can still vote in the poll HERE.